SSOE is a global project delivery firm for architecture, engineering, and construction management. It is our mission and our promise to make clients successful by saving them time, trouble, and money. We hold ourselves accountable by documenting our savings—more than $1 billion saved for clients since we started tracking in 2009. We differentiate ourselves through collaboration: from the way we treat each other to how we deliver projects. We align project stakeholders, create a common vision, and deliver that vision. We specialize in delivering complicated, high-stakes projects and value through long-term program management and sustaining support. The SSOE Experience is the combination of our Value Promise and Great Client Service that results in trusted relationships. The quest to deliver value drives every decision we make. 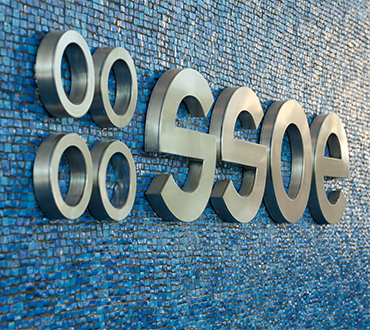 SSOE returned 95% of our fee to clients in the form of project savings over the last 5 years. We’ve saved our clients more than $1 billion since we began tracking in 2009. Making clients successful by saving them time, trouble, and money. World-class people, delivering world-class projects, for world-class clients. Continuous efficiency improvements / innovation. Adding the greatest client value and environmental sustainability. Safety – Provide SSOE employees, visitors, and contractors with a safe and healthy environment. Quality – The practice of utilizing standard procedures to achieve consistent deliverables while meeting or exceeding client expectations. Integrity – Being honest, moral, and ethical. Agility – The ability to rapidly and continuously adapt to market and environmental changes in productive and cost effective ways. Collaboration – Working together as a team to create a superior outcome. Innovation – Employing creativity to develop new and fresh ideas that deliver maximum value. Diversity and Inclusion – Learning about, embracing, valuing, and including the full range of human differences. Social Responsibility – Making choices that acknowledge the best interests of our environment, communities, and stockholders. The independent analysts at Great Place to Work® honored SSOE with the “Great Workplace” certification for the third consecutive year based on exemplary ratings provided by SSOE’s U.S. employees in an anonymous survey. This award recognizes SSOE’s commitment to our employees as well as our extensive list of benefits programs and employee perks. Click here to read more. SSOE was named 2018’s “All-Star Employer” by Samaritan Health Plans for exemplifying best in workplace wellness, recognizing the firm among the more than 35 companies in Oregon that competed for the honor. Click here to read more. SSOE has been recognized as one of the fastest-growing architecture, engineering, planning, and environmental consulting firms in the U.S. by management consulting and research firm Zweig Group. Click here to read more. CHC Wellness honored SSOE with the Culture of Health Award. This award recognizes leadership in raising the level of engagement among employees by creating a culture of health that encourages, supports, and rewards healthy living. SSOE was selected for setting a standard for wellness within our community, displaying a top-down effort that has positively impacted the lives of our employees, and for dedicating considerable efforts to expand participation in our wellness programs. Click here to read more. SSOE was ranked the second largest engineering firm in Birmingham for the third consecutive year in the Birmingham Business Journal’s Top 25 Engineering List. This ranking was based on the total number of local licensed professional engineers. Click here to read more. The Ohio Distinguished Employer Award by the Ohio Cooperative Education Association (OCEA) recognizes exceptional commitment to providing learning and employment opportunities for co-ops. The award takes into account the quality of work assignments as well as the special assistance and opportunities provided to full-time co-op students and the institutions they represent. SSOE was nominated by Vicki Kuntz, Director, Engineering Career Management Center at The University of Toledo. Click here to read more. Despite the high stress and anxiety levels that often accompany uncertain economic conditions, SSOE has managed to help our employees live less stressful lives. In 2010, the Ohio Psychological Association (OPA) named SSOE one of four psychologically healthy workplaces. To be considered for this award, an application must be submitted to the OPA and a panel of OPA members must conduct a site visit. The workplace is evaluated in five areas: employee involvement, employee growth and development, health and safety, employee recognition, and work-life balance. Click here to read more. SSOE was recognized as Middle Tennessee’s Healthiest Employers (Large Company: 500-1,499) by Nashville Business Journal. The publication honored 20 finalists with offices in Middle Tennessee. Finalists were broken down into five categories, based on size, with one winner named in each category based on overall score. Companies were judged based on wellness programs for employees. Criteria included cultural commitment, foundational components, strategic planning, programming and intervention and reporting and analysis. The Parent-Friendly Workplace Award recognizes a company / organization that is supportive of family obligations and is a great place to work. Employees need the flexibility to make decisions in the best interest of their families while meeting their employment responsibilities. This award honors employers who understand and provide that flexibility. At SSOE, work-life balance is a key value and is one of the factors contributing to our high employee retention rate. An important aspect of attracting and retaining the best people is offering them what they want and need from an employer. In 2008, SSOE was honored for our outstanding human resources program in the form of the Human Resources Award for Excellence from the University of Toledo and the Toledo Area Human Resources Association. This award was presented based on SSOE’s outstanding recruitment program as well as our clear career progression track, industry leading 401(k) and profit sharing plans, flexible benefits program, wellness program, and training and development program—all resulting in our high retention rate. Click here to read more. Building Design + Construction Magazine (BD+C) named SSOE a “Best AEC Firm to Work For.” This honor is given to industry-leading architecture, engineering, and construction firms in the U.S. and is a valuable third-party endorsement of our efforts as we compete to attract and retain top talent in a tight labor market. The award was based on SSOE’s holistic approach to benefits, which we call our Employment Value Proposition. Quality is the practice of utilizing standard procedures to achieve consistent deliverables while meeting or exceeding customer expectations. At SSOE, quality isn’t an additive—it’s an integral part of every workday and every project. We don’t cut corners when it comes to quality. SSOE has established effective, efficient quality processes and management practices, in addition to our continuous improvement efforts. Our Quality Systems Policies and Procedures comply with ISO 9001:2015 standards, as verified objectively during our annual quality assessment, conducted by an external certified QMS professional. Company-wide project / process audits ensure all of our offices are consistently following the same procedures. We review and update these procedures regularly to adapt to ever-changing markets and practices. The collaborative culture at SSOE demands ongoing development of processes and methodologies to improve interdisciplinary coordination. We utilize a “Lessons Learned” process to provide an organizational training tool that fosters timely, productive improvements built on performance strengths gained through overcoming areas of instability. SSOE is an active member of the Lean Construction Institute (LCI) and a leader in the area of Lean practices in the various markets we serve. Lean training curriculum expands these practices throughout the organization, delivering more value to our clients and driving our commitment to quality, innovation, and continuous improvement.